With summer right around the corner, I was thinking about some of the things that are great beauty & lifestyle hacks for this hot time of year. 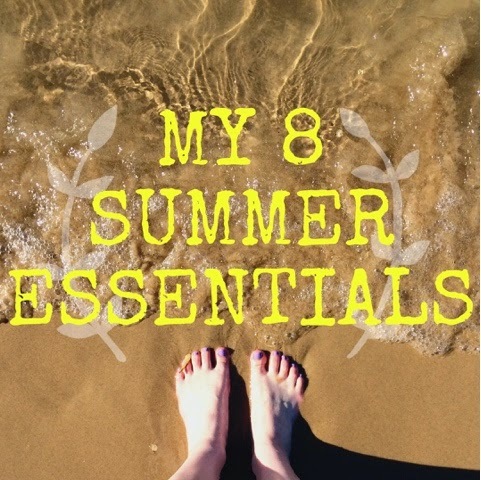 Here is my list of 8 of my summer essentials. I've been trying to be cool & get into the whole 'floppy hat' in style thing.. My problem was that I just felt goofy in it. Then I realized, who cares. I bought my first one a week ago & now I've worn it once already in Chicago. Not gonna lie, I feel pretty fancy in it. Here's a hat similar to mine. Since the signature look of summer is wavy hair, sea salt spray is an awesome trick to giving your hair texture & wave. I personally curl my hair with a flat iron & then to loosen up the curls, spray my hair with sea salt spray. It gives it a more natural look (even though I naturally have straight hair!). My favorite is Not Your Mother's Sea Salt Spray which you can find here. I work at a pool store & summertime is clearly our busiest time of the year. When I have a good water bottle, it makes me want to (& remember to) drink more water. When I'm working, this is the best water bottle I've found that stays cool & sturdy. As I'm clearly on vacation right now, I've realized that walking around town in a breezy dress is so much more comfortable than sticky shorts or pants. Although today is currently frigid in Chicago, yesterday I wore a fun summer dress which you can find something similar here. It kept me nice & cool while still looking stylish. I have been absolutely OBSESSED with Salt Water Sandals this season. I don't know why I didn't know about them sooner. I currently have two colors & they are super cute & even comfy. They don't really have arch support, but there's something about them that makes them comfortable. They are great shoes to walk around town in & I even broke them in at the beach yesterday. They are safe to wear in water & would be great for kids as well. You can find them here. I've been trying to be better about keeping my eyes safe lately. I've always been really bad about not wanting to wear sunglasses because they rub up against my nose or ears funny. This past year though, I've found a few different pairs that are comfortable and stylish at the same time.. Which makes me a little more opt to wear them. You can find some cheap & cute sunglasses here like mine. I seriously could not go without running shorts in the blazing hot days of summer in Oklahoma. They are fun to wear as something casual, they're comfy, & they don't stick to you. My favorites are Nike Dri-FIT Tempo which you can find here. As we all know, summer is the time of year when we all sweat like nobody's business. I like to keep a small travel size body spray in my purse or car to use whenever I feel the need to freshen up a little. My favorite is Tease by Victoria's Secret which you can find here. Hope you all enjoyed my list of my 8 summer essentials! What are some of your summer essentials?